Looking back through the DPRP Concert Reviews index I pondered if it had really been more than four years since Tull lasted toured in my neck of the woods. The answer was no, but for some reason I had not written a review of the March 2006 concert, so to make amends and less than a week since catching them in concert, I bring tales of the Acoustic Tour 2007. And a change of venue this time around (and a little closer to my home) as the band appeared at Middlesbrough Town Hall. Customarily it has always been Newcastle City Hall that has hosted the North East leg of the Tull Tours. This might well be the first visit Middlesbrough Town Hall, I’m not quite sure, but hopefully as the concert was “sold out”, perhaps not their last visit. 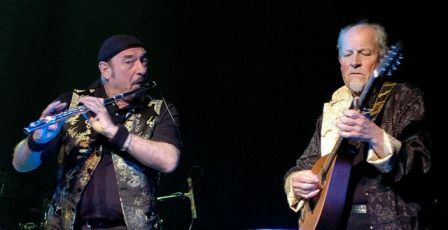 The band line-up was of course Ian Anderson (flute, vocals & acoustic guitars) and Martin Barre (acoustic and electric guitars, bouzouki & flute). 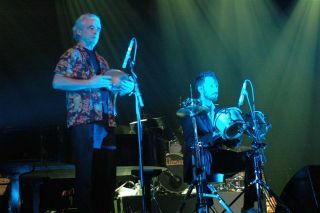 And joining them for this particular leg of the tour were John O’Hara (piano, keyboards & accordion), David Goodier (acoustic and electric bass & glockenspiel) and James Duncan (drums & percussion). The final ingredient was the delightful Anna Phoebe (violin), who like the previous year’s concert saw the inclusion of an integrated support act with a young and attractive violinist. 7:30 and enter the stage Ian and Martin travelling back to the bluesy beginnings for Tull with a duet version of Someday The Sun Won't Shine For You, taken of course from the band’s debut This Was (1969). The only time that the blues harp (harmonica) will appear on the evening. Skipping ahead a few years and Tull’s first foray into the “pop charts” is the opening tack of Anderson's introduction. As Ian remarked not many tunes in 5/4 have charted over the years – Dave Brubeck’s Take Five and of course Tull’s Living In The Past. The track was greeted with huge applause as the audience settled into what was to be a very memorable Tull gig. Now it may just be my imagination, but Ian's flute work seems to improve every time I see him play... tonight was no exception. 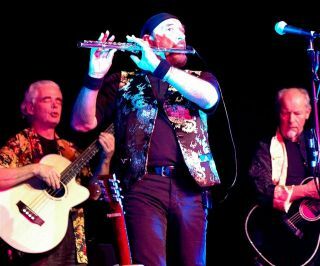 Another aspect of the Tull shows that "improves" every time is Ian's stage craft and over many years and countless gigs Ian Anderson has honed his stage craft and as raconteur amuses and puts the audience at ease. Even my wife, who I took to her first “prog” concert in many a year was charmed by his stage persona and I’ve even pinched her description of Ian as an amusing raconteur in this article. Following Living In The Past, two tracks with Anna Phoebe who slotted remarkably swiftly into the Tull mould, performing and even out manoeuvring the ever agile Anderson as they exchanged themes, melodies and solos. The Secret Language Of Birds is visited with The Water Carrier before two tunes from Phoebe, Gypsy (the title track from her debut album) and the emotive Katrina’s Theme, played as a duet with John O’Hara. Anna’s own material fitted remarkably well within the Tull set and complimented the evening’s performance immensely. Enter stage the other Tull members and exit briefly Ms Phoebe as they strike up Jack-In-The-Green from the wonderful Songs From Wood (1977). Followed by yet another of the many highlights of the evening for me, however the announcement of a “new tune” from the Tull camp added an even larger grin to my face. Could it be possible an album of new material from Tull is on its way. And if this new material is in anyway reflective of The Donkey And The Drum then we may well be in for a treat. Again Anna Phoebe seemed well at ease with the music and bounced off Ian Anderson with consummate ease. Next we visit the Stormwatch (1979) album with Dun Ringill performed by Anderson and Barre – a superb interlude – before the band takes us through Birnam Wood To Dunsinane, Fat Man and the evergreen Bourée – which once again roused the audience before the interval. The Interval and time to reflect on the concert so far. I’ve made little mention of the three “new members”. Of course David Goodier, James Duncan and John O'Hara will be familiar to ardent Tull fan's having all made contributions to Ian Anderson's Rupi's Dance and James guesting on Panama Freighter from The Secret Language Of Birds. It did feel a little strange after so many years not to see or hear the familiar rhythm section of Doane Perry and Jonathan Noyce and certainly the onstage antics of Andrew Giddings were certainly missed. Musically however I had no complaints, the rhythm section which was tight and concise – perhaps not as free flowing – but this may just be the nature of the more acoustic setting. 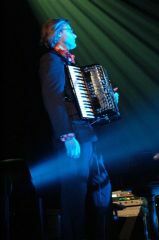 John O’Hara possibly had the more difficult task as the role of the keyboards within Tull’s music is finely balanced. The mixing (nothing to do with John I feel) was a little suspect in places – but these were minor blemishes and in general the sound was clear and well mixed. However following Andy Giddings stage persona may have proved slightly more difficult, so John played the role straight. A wise move I think. As the somewhat ageing audience re-appeared from The Crypt bar, the hall lights dimmed and once again on with the show. Oh yes, the lighting, which employed a mixture of traditional parcan lighting and intelligent moving heads was used to great effect. The back lighting being quite impressive without detracting from the music. The opening tune, 99 Lives was taken from Anna Phoebe’s album, before we moved into more familiar territory with an abridged version of Thick As A Brick. Gerald Bostock’s lyrical masterpiece condensed. Delightful was the reworked version of (King Henry's Madrigal) Pastime With Good Company. As has now become customary the following piece was Martin Barre’s spot, the acoustic bluesy Steal being the choice for this concert. And so to the high spot of the evening Aqualung. Now I have to say that in recent years this has become less of a favourite in the Tull live set. However this reworked version was magical and prompted me to listen to the album as soon as I returned home. I sincerely hope that a recorded version of this arrangement becomes available. So if Aqualung was the highlight then Elmer Bernstein’s America had to be the surprise. However Ian and Co chose to undertake Keith Emerson & The Nice’s version of this tune. Splendid stuff indeed and with such a catchy melody and stomping rhythm it had to be a crowd pleaser. Hearing “modern day” covers within the Tull set seems a little strange, although on this occasion I was slightly more prepared following their 2006 tour which featured sections from Queen’s Bohemian Rhapsody and a full blown rendition of Led Zeppelin’s Kashmir (inc Whole Lotta Love). We return to Aqualung once more and the strains of My God sadly herald the nearing of the end. A Tull favourite, (although not particularly one of mine), that sat comfortably within the acoustic set. I mused the notion (as I had on the previous tour) that with a violinist in the fold, something from the A album might have surfaced. However not to be and the closing piece for the night was a medley of tracks Beside Myself/Rocks On The Road/Budapest. Anderson’s ever expressive flute work bringing the evening to a flamboyant closure (almost). Perhaps an opportune moment to comment on the Acoustic Tull sound. I was a little dubious before the concert at the thought of an all acoustic set. Tull already include a strong acoustic element within their music, therefore I feared this may be a watered down Tull or worse, Tull-lite. I should have kept my trust in Messrs Anderson and Barre, as none of the magic or intricacies of the Tull music were lost. Perhaps some of the rockier material suffered a little, however the clever re-arrangements carried the music through. 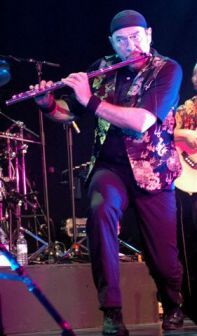 Ian Anderson was as captivating as ever, his lyrical flute weaving its' spell throughout the evening. Martin Barre proved once again to be the hidden treasure in the Tull camp - his acoustic playing complimenting and embellishing the music. Opportune moment! Well having refrained all evening, the electric guitar made its’ one and only appearance for the encore Locomotive Breath. Truth be known I reckon this was the biggest smile on Martin’s face all evening. A rouser to finish. Having seen Tull over many years now and in numerous settings, I found this Acoustic version to be one of the highlights, demonstrating that despite the lack of new album material, Tull are far from being a spent force and merely move from strength to strength. I chatted outside the concert with a friend and we remarked that no matter how many times we had seen the band, they never seemed to repeat themselves. I “hear” some sceptics glancing at the set-list and querying this remark, however I qualify this by saying that although the tracks may be very familiar the arrangements are far from such. The reworking of Aqualung was breathtaking, and a far cry from any previous rendition I’ve heard. 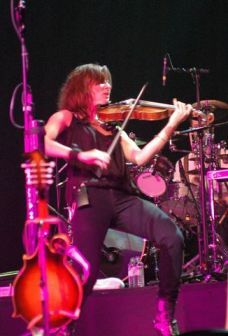 It also brought up the question – when does Ian Anderson find the time to do these major overhauls? Now what would be nice is if we might capture some of these magical live moments… on CD or DVD? There has been much debate over recent years regarding Ian’s vocals, not now what it once was, however the more acoustic setting here certainly helped matters - Dun Ringill was in fact superb. Personally it is not a problem for me – an unavoidable blemish on a truly remarkable musician and showman. Tull and Ian Anderson continue to tour tirelessly – so if you haven’t managed to see them yet (or recently), do yourself a favour and catch them soon.